Comprehensive Compilation of Canon Law Issued by Successive Popes: GREGORY IX, Decretum, edited by Raymond of Peñafort, with the Glossa ordinaria of Bernard of Parma - GREGORY X, Constitutiones novissimae, with the gloss of Johannes Garsias Hispanus – Constitutiones of Alexander IV – Clement IV – Nicholas III – Urban IV – Simon legate – Nicholas III, Exposition on the Regula fratrum minorum, in Latin, manuscript on vellum, illuminated by the workshop of Maître Honoré. Paris, c. 1275-1300. 440 x 270 mm. 283 leaves, with five column-wide miniatures in colours and gold, three historiated initials and eight large foliate initials. 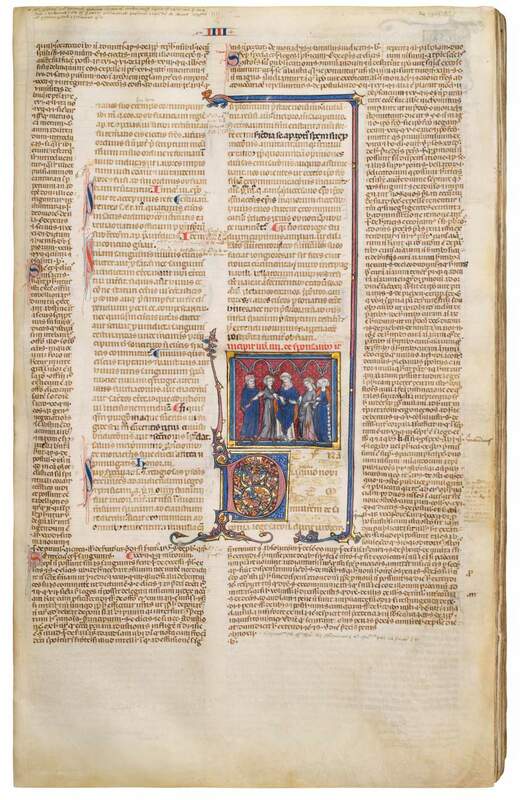 This legal codex includes: Gregory IX, "Decretum", edited by Raymond of Peñafort, with the "Glossa ordinaria" of Bernard of Parma – Gregory X, "Constitutiones novissimae", with the gloss of Johannes Garsias Hispanus, and seven further legal texts. With five miniatures by Maître Honoré, and decorated throughout in his workshop..
440 x 270 mm. – 283 leaves. With five column-wide miniatures in colours and gold, three historiated initials and eight large foliate initials. Imposing legal codices were mainly used for study and education, but the high quality of decoration of this book suggests this was an important and expensive commission. It was possibly ordered by a high-ranking cleric for personal use or it was made as a special gift. It was copied in the university milieu of Paris and then decorated by Maître Honoré who ran the most important Parisian workshop of the time. The book opens with the Decretales promulgated by Pope Gregory IX in 1234. It was the first official compilation of canon law since the Decretum Gratiani (c. 1140) and consisted of five books. Next follow twelve more treatises; the most recent referring to 1281. The marvelous miniatures show: f. 1r: Pope in the middle of his counsellors pointing at his book, and: Initial G: Scholar at lectern contemplating his work – f. 65r: Dominican monk and clerics discussing the case of a lady holding a sealed charter, and: Initial D: Scribe writing – f. 123r: Expulsion of a laic from the liturgical space during mass – f.178r: Marriage ceremony by joining right hands – f. 195r: Pope judging the case of an abbot – f. 272r: Initial S, Cardinal at lectern. Such grand legal codices are exciting objects. Made for use, texts were supplemented, added to, cancelled and deleted. This book belonged to a certain Johannes de Castex who twice added his note of ownership, but lhe may not have been the first owner. Being a canonist, he added a number of sophisticated glosses (comments) in and above the texts and in the margins – among others those by Johannes Andreae, which date to the first quarter of the 14th century. Castex's name indicates that he came from the region of the Langue d’oc, but he remains as of yet unidentified. Possibly he was connected to the Papal Curia that resided in Avignon from 1309. This book is a fascinating testimony to the world of art and law in late 13th century Paris and beyond.